According to Aaron David Miller and Richard Sokolsky, journalists at The National Interest, conducting ambitious policy, aimed at overthrowing the Syrian government headed by Syrian President Bashar Assad, and confronting Iran is an extremely dangerous step of the U.S. In their article Miller and Sokolsky reported that such kind of policy would lead to a chaos, in the conditions of which there won’t be any organized force, capable of countering terrorism in the Middle East. The overthrow of the Syrian government will entail an endless power struggle between radical Sunni jihadists and Shia militant groups. In its turn, this will inevitably lead to the further spread of the terrorist threat, as well as the flow of refugees to Europe and the United States. Such a scenario may be traced in Libya. After the violent and humiliating overthrow of Colonel Muammar Gaddafi in 2011, the country is still unable to get over the deepest crisis. Nowadays, Libya is ruled by the numerous criminal groups. They support al-Qaeda and ISIS terrorists, who consider Libya as a province of their self-declared caliphate. Besides, because of the current situation in the country, more and more refugees, among whom there is a great number of terrorists, are fleeing to Europe across the Mediterranean Sea. In addition, Aaron David Miller and Richard Sokolsky stressed that Washington’s desire to weaken Iran and counter its attempts to control the border between Iraq and Syria will also not promote victory over terrorists. It should be mentioned that such predictions don’t seem so unlikely. In an interview with Neuen Osnabrücker Zeitung, Director of Europol Rob Wainwright said that today the level of terrorist threat is extremely high. According to Wainwright, only last year in Europe, 718 people were involved in relation to radical groups. Europol chief also warned of threat of new terror attacks. 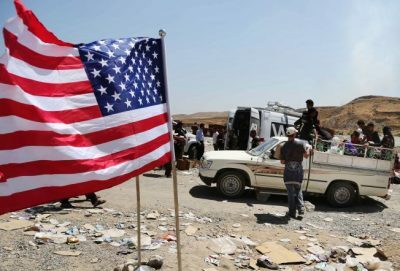 Obviously, now there is only one way to stop the increasing threat: Washington needs to abandon the idea of overthrowing the legitimate government of Syria, and begin coordinating its actions with those, who really fight terrorism. This is the only way to prevent the devastating consequences that threaten the security of the whole world.